Fantastic!! the ASI Year Book has arrived and as usual it is an informative read. Once again brilliantly Edited by Thomas Fietz. 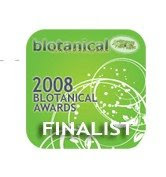 The Aril featured on the cover 'Hakuna Matata' (A & D Cadd) Mohr Medal Winner 2007. Cover credit ASI. 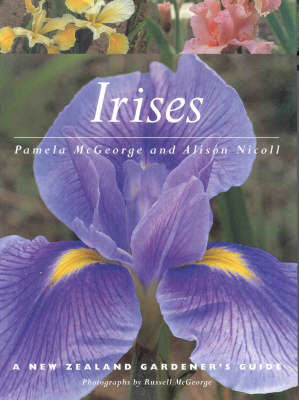 For all you folks that visit this blog and there are many of you (By the way Thanks once again for visiting) The Year Book is distributed to members of ASI anually 165+ pages of information and a large amount of colored photos of Aril Irises. Iris lovers worldwide who wish to receive quality Aril iris information plus the many other benefit's of membership should give serious thought to Join The Aril Society International it's a great investment.The best Membership Deal is $28.00 US triennial which includes $12.00 credit for the plant sale in the first year of membership or when renewing membership. Australian and New Zealand members receive an $8.00 credit voucher for the Seed Exchange in the first year of triennial membership or triennial renewal. For all my New Zealand friends and visitors who might just read the next post but are frustrated at not been able to purchase the featured Aril iris plant This posts is for you!! The best thing about 'Esther the Queen' is that you get an exotic Aril Iris and a Historic Iris all rolled into one!! The plant gives good increase. These Iris are classified as OGB which is a Oncogeliabred , an iris hybrid of oncocylus and bearded iris parentage and considered to be the easiest to establish.Generally Arilbred's can be established in conditions similar to the bearded irises just grow in a summer dry garden in a rich warm soil with sharp drainage full sun, and they will bloom their socks off for you!!! !Esther the Queen is available in New Zealand from The Iris Garden Christchurch and at $10.00 per plant is a very reasonably priced. It's sold bare rooted so order one now to be sure you get one next season.If you live in Christchurch you may be able to drive out to the Iris Garden this weekend and pick up some iris growing in pots. Just do not forget to Join The Aril Society International for a triennial deal that will never be repeated!!!!! Three years for $28.00 US and at today's dollar conversion that's $36.00 NZ or $12.00 NZ per year plus a $8.00 US Voucher for you to spend on seed. Brilliant!!!! For Our American visitors there is a large list of commercial growers listed on the ASI web site that may stock ETQ. Check it out! ASI 2006 Checklist ESTHER, THE QUEEN OGB (Eugene Hunt, R. 1967). Sdlg. ORB 64-1. AB, 36” (91 cm) E-M. S. wisteria blue, deeper veins, blended willow green at base, brown at claw; F. willow green, blended erythrite red; dotting by black beard on black maroon spot, paling to brown as it blends to willow green. (Sundt 5631D: (Ardrun x Ib-Mac) X Kalifa Gulnare). Tell’s Iris Garden, 1968. Alpine Meadow was a complete mystery to me as I have never seen the iris growing and all I have had to date is a couple of catalogue descriptions and an artist's enhancement of the bloom shown above which is the cover of the Stevens Bros Catalogue 1955-56. Two days ago a fine Irisarian and generous friend Sarah Cook in England returned from her European trip and sent me this amazing photo of Alpine Meadow. 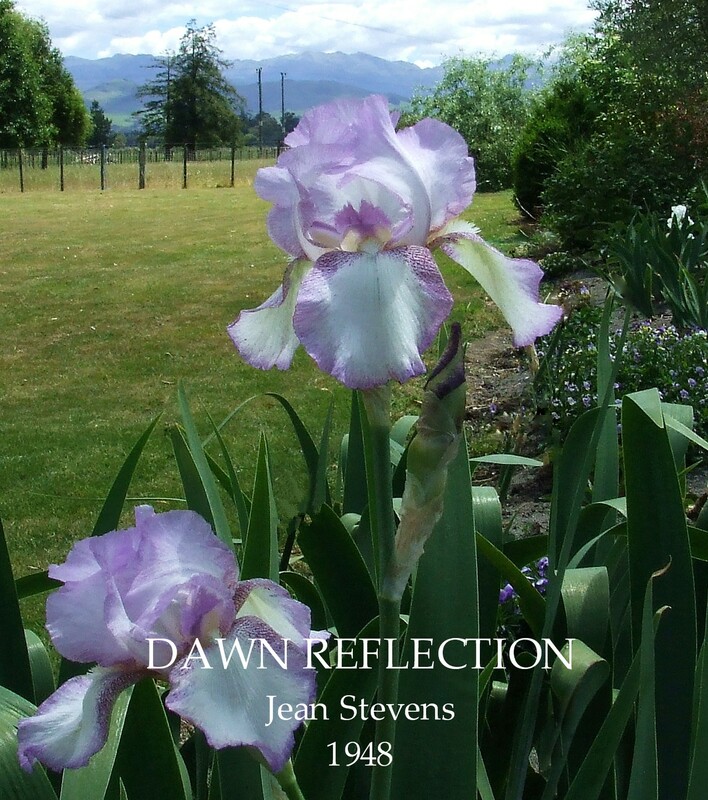 It is a big thanks to Sarah that New Zealanders get to see one of the great irises of Jean Stevens breeding lines which got major raps when first released 53 years ago. Photo was taken last week in Merian Park, Botanical Garden, Brüglingen, Switzerland. This iris major's in the classic form. To understand the respect and high regard that Jean Stevens commanded in the Iris growing world the description below written by Robert Schreiner an internationally respected hybridiser himself in the Schreiner's Iris lovers Catalog 1955 says it all. 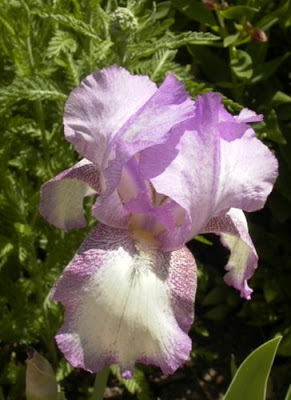 ALPINE MEADOW (Stevens 1955) M 34" Unlike Alexander the Great, Iris Hybridisers need not sigh for more worlds to conquer. Many color realms still remain unconquered, yet the famous New Zealand Hybridist Mrs Stevens has once more crossed a new frontier. Here is an iris of a color combination without counterpart in commerce. Standards are clear white and falls a tint of soft blue, not the deep violet of older amoenas like Wabash. Alpine Meadow might be described as a blue 'Pinnacle'. This medium size flower is the first of what we feel certain will be an entire series of pastel amoenas differing from any now existing. Breeders will be glad to note that Alpine Meadow bears fertile pollen and seeds well. Please respect Sarah Cook's copyright. I am pleased and honoured to announce this blog has been added to Te Puna Web Directory at The National Library of New Zealand. The selection criteria is 'Personal sites where they contribute to the documentary record of the nation's experience'. The aim of Te Puna Web Directory is to provide a subject gateway to selected New Zealand Internet information resources that help libraries, their users, and all New Zealander's meet their professional, educational, cultural and personal information needs. Paperback, 96 pages, 190 x 255mm, NZ, 2001. RRP.$30.00 NOW ONLY $12.00 plus p&p. Terrific value!!!! Identifying Historic or any Iris for that matter is fraught with difficulty partly due to others or your own preconceived ideas, or information which is slightly off base. 'Dawn Reflection' has been one such journey, but I got there in the end as I gave up listening to people who have that uncanny knack of imagining irises into existence. 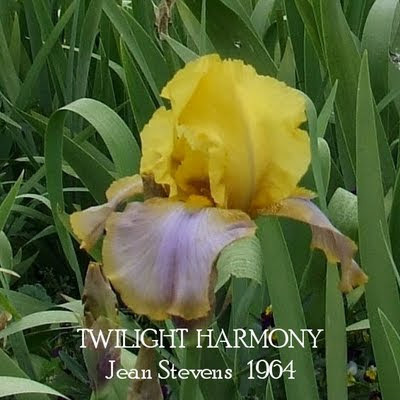 Last growing season I was gifted all the irises growing in Wanda Williams garden and 'Dawn Reflection' was part of the gifts it was also documented as growing in the Williams Garden by Iris Convention attendees in 1956. The seedling # 1/U86 (Dawn Reflection) first bloomed for Jean Stevens in 1946, and her notes state " Rosy Plicata lightly toned 3½ ft.". 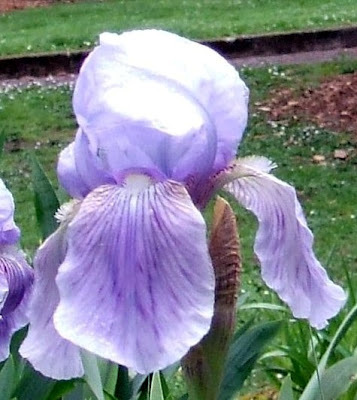 Jean originally applied to have the iris registered as 'Pygmalion' but the name was turned down by the AIS registrar as 'Pygmalion' had already been used to register a Japanese Iris in 1938. The new name 'Dawn Reflection' was confirmed 4th June 1948. It was in March 1948 Jean sent by surface mail 3 plants of the seedling #1/U86 among others plants to Schreiners. 'Dawn Reflection' has its developing buds that have a barbers pole effect which is always that something extra. I have distributed this iris to others, so it now also grows in two Garden's in Auckland and two gardens other than my own in the Wairarapa so I guess you can say it is risk managed. For most New Zealand gardeners this would be the first time they have seen this iris that was originally introduced by Jean Stevens in 1948. Stevens Bros, Wanganui. 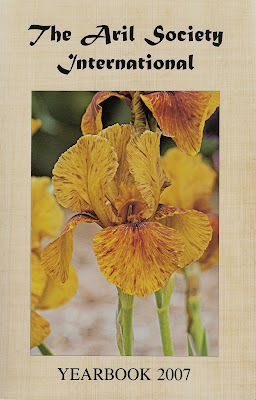 Irises 1948-49 Catalogue. DAWN REFLECTION (Stevens) Very lovely in its flared and waved form, of wonderful substance and gleaming texture, this new iris has a dainty grace which makes an instant appeal. It is a plicata, yet has two virtues which few plicata's possess, garden value as a clump, and a soft pink colour tone. The ground colour is ivory with the margins of the flaring falls softly stitched in pink. The waved standards are richly flushed and stitched rose pink. Excellently branched stems carry the huge blooms to a height of 3½ ft. 50 Shillings. Schreiner's, Salem,Oregon,Iris Lovers Catalog, 1952. DAWN REFLECTION (Stevens 1948) M 36"
Dawn Reflection (Stevens '48) 42". Soft Pink tone plicata on ivory ground. Marble Iris Gardens, Grandview, Washington, Iris Colorama Catalog, 1961. DAWN REFLECTION (Stevens 1948) M 36in. A very large plicata with immense blooms attractively flared and waved. It has the ground colour of glistening ivory, sparingly and precisely etched rose-pink on the falls and more generously suffused and etched a bright lilac pink in the standards. It is very effective in a clump. I have displayed two photos of 'Dawn Reflection' which shows slight colour variation and also shows the difficulty in capturing the colour soft pink. Above photo thanks to Bill Edington. For the colour 'Rose Pink' refer Ridgway 249. 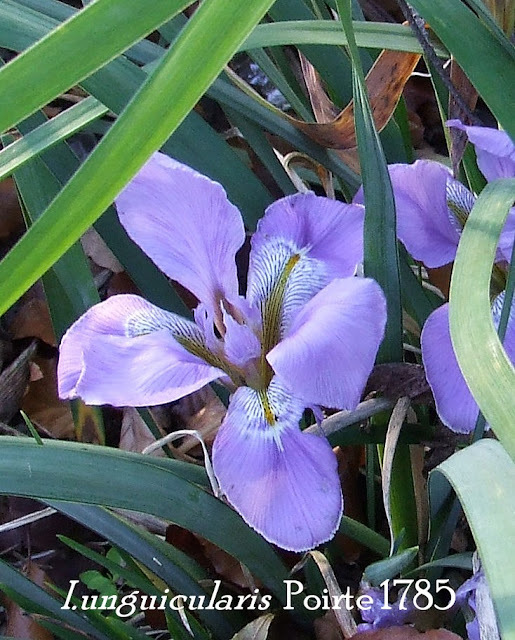 This is the Winter flowering iris is often referred to as 'Iris stylosa' or 'Algerian Iris'. A Frenchman named Desfontaine in 1798 discovered the iris in Algeria, giving it the name of Stylosa on account of its peculiarity in the way the style rises some distance in the flower before branching out to form the style arms. However Desfontaine later found that a compatriot, Poiret had discovered the iris thirteen years earlier and had given it the name unguicularis taken from the Latin "unguis" meaning claw with reference to the claw-like formation of the style and its branches. It's reliable habit of non stop winter blooming an established plant very quickly becomes a terrific asset to the winter garden. Stunning lavender blue flowers are 10-20cm (4"-8") tall and are often hidden among the long 40-60cm (18"-24") evergreen drooping leaves which are pleasant to the eye all year round. Grow it against a sunny wall of the house, it will thrive in a lime stony soil and it loves neglect. The longer and dryer the summer, the better bloom the following winter. The leaves as you can see in the above photo can get untidy and ratty-looking so a light pruning late summer of older leaf growth will tidy up the plant, and stimulate new clean growth. Originally from Algeria, Greece, Turkey, Syria, Israel, and Lebanon. There are several New Zealand registered varieties 'City of Sails', 'Bunty',and 'Violet Crescent', are a few, but where these plants can be purchased from is a mystery, which is most annoying. This iris was given to me as a gift, and I cannot find a commercial seller of this iris in New Zealand so if someone knows perhaps they would be kind enough to leave a comment on where it is available from. Most certainly another irresistible iris. Karin Olding a New Zealand bre d Intermediate Iris Hybridised by Glady's Watson and registered in 1978 (I cannot find much information about this lady).Length of bloom makes this is one of the best reblooming intermediate irises. Yesterday I was chatting to Gloria Rapson one of New Zealand's finest Irisarian's ,who informed me that in her Tauranga garden Karin Olding is currently a mass of bloom stalks and flowering is expected within the week. KO starts to bloom for Gloria in June and can still be blooming at Christmas Time and into January. The temperature is a lot warmer in that part of the country than it is here but Karin Olding is one of the first to bloom in the Wairarapa. Whilst the flowers would not be considered perfection by the so called NZ Iris Growing Elite the iris can not be faulted for its bud count,the bud colouration, its good increase, and its extraordinary long bloom season makes it an Iris your garden can not be without. Its registered Bloom season classification is VE (Very Early) but if this Iris was to be registered today it would probably have a bloom season classification VE-ASRE. (All Season Rebloom)Its amazing homozygous recessive condition would mean it has enormous breeding potential as a parent. KARIN OLDING (Mrs G Watson R.1978) Sdgl; W2-31-63 IB, 22" (56cm) VE. Light blue,overlaid and veined deeper blue on Falls;Yellow beard tipped white.Helen McGregor X Schreiner sdlg. Last bloom season was the first time I had seen KO in all its glory, it instantly became a 'Must Have' in my garden, and 3 Rhizome's of Karen Olding were purchased for a group planting. 'Soliloquy' is a garden blog I recommend you visit .Yesterdays post "Little Earth Stars" is an excellent example of the first class writing and the food for thought that is a consistency with this blog. It's the thinking person's Garden blog. Please visit the site by clicking on this link SOLILOQUY and then click on visit blog so we can vote this lady into the top ten blogs on Blotanical where she deserves to be. For me Dandelions will never be the same again. Tall Bearded Historic Iris "SHANNOPIN"
This photo of the iris "Shannopin" was taken growing in a garden of an old heritage house in Masterton at peak bloom time. My first association with this iris was as a NOID, found growing opposite a Butcher's Shop so I originally labeled it "The Butcher's Iris". This garden was small, directly adjacent to a tar sealed footpath and was overcrowded with rhizomes, buttercups and other plants, and had there been a competition for 'The best Iris surviving in a neglected garden' category it was certainly the clear cut winner. Flowers mid-late season. An iris of classic form, widely grown and admired in mainly older gardens of the Wairarapa District. SHANNOPIN the iris was named after 'Shannopin's Town' which in the 1700's was a Delaware Indian Village located near the site of modern day Pittsburgh, Pennsylvania. The hybridiser T. Lloyd Pillow was Pittsburgh's superintendent of Street and Sewer Department. 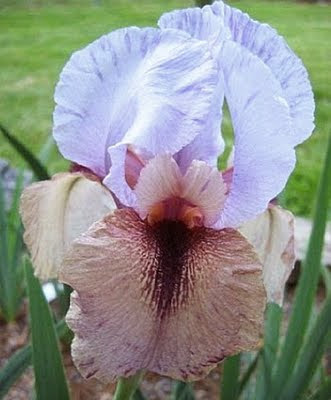 The first of his three registrations was in 1939 a tall bearded iris NANTY GLO. In 1943 he introduced a tall bearded iris CONNOQUENESSING a native American word meaning "A Long way Straight". All of the names Lloyd Pillow used to register his Irises have an association with 'Shannopin's Town' or the associated Pennsylvania area. Stevens Bros, Wanganui, Irises Catalogue, 1948-49. 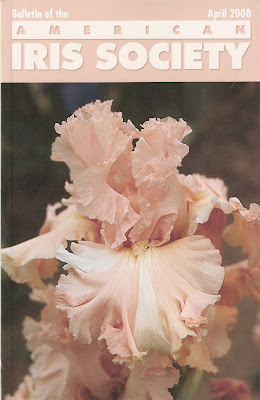 Schreiner's, Salem,Oregon, 1948, Iris Lovers Catalog. 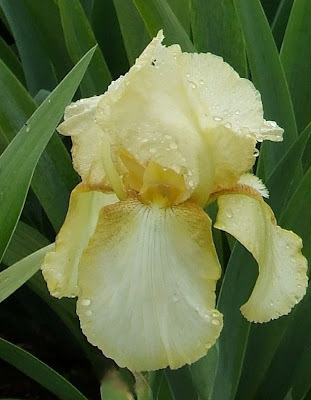 If you love historic irises and you get a chance to purchase this iris don't hesitate. I guarantee it will be a iris you will never regret growing. No commercial grower in New Zealand, and the American Garden that I knew stocked it has now closed. Sylvan Song a recent addition to my collection and another amazing New Zealand introduction from Jean Stevens. This iris when it clumps up (I have several plants) will 'look the business' when growing among the darker blues. A very distinct and novel personality is inherent in this lovely rounded flower of largest size and faultless form. A true self, the colour is quite new, and can be visualised as a warm honey-cream. A faint dusting of cinnamon brown at the hafts gives a rich almost vibrant note unexpected in such a light toned flower. A variety which will become extremely popular having nothing of the pallid washiness one usually associates with pale colour tonings 4ft. Finally I take this opportunity to Thank Ms.Wanda Williams (Deceased) and her gardener Wayne Brown for their impeccable good taste in Irises which had made them accidental guardians of a collection of Jean Stevens Irises that endured for decades. Martha Stewart "Living" Magazine,May 2008, out in stores now!! 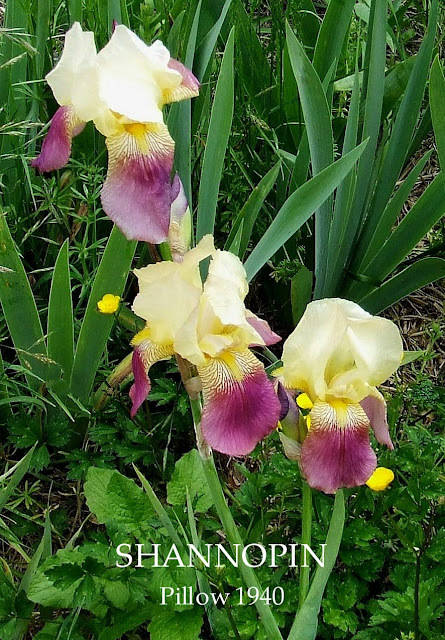 features A Gardener's Palette "Few flowers come in as many shades of the spectrum or are as versatile as the Tall Bearded Iris", Schreiner's Iris Garden played a big part in this article. Good to see Irises on the up and up!! Fantastic!! the April 2008 AIS Bulletin has turned up and as usual it is an informative read. 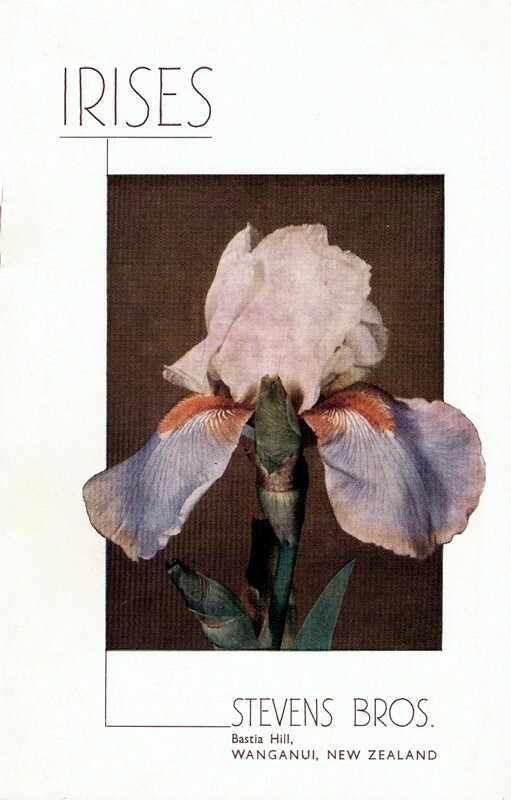 The picture featured on the cover is Keith Keppels 1998 introduction "Broken Dreams" an Iris I received as a bonus plant from a grower this year so I am 'over the moon' It sure looks good. Photo credit Terry Aitken. Autumn really arrived in the last two days. light dusting of Snow on the hills this morning, 1° Celsius at 6am, currently 4°C at 11:23am . The temperature drop has helped with brightening up the autumn foliage which is looking brilliant especially the Liquidamber styraciflua. Pictures of the hills from the top paddock and the trees turning colour. That's the end of the reblooming Iris as all the bloom and buds have just turned to mush. In a couple of months time the Iris bloom will start again. I have only just found the list in Blotanical which is the directory the 200 Most Recent Posts and it seems that it is almost impossible to obtain the status of "Recent" when you live in New Zealand as Blotanical places my current post in Yesterday's date. I published a blog Thursday 1st May and its instantly placed on Blotanical "Most recent posts" half way down the Wednesday 30th April section. Half a day later and its not on the list at all. Amazing! !